Anthoine is a GP3 champion ! Anthoine Hubert had an appointment with the History last weekend in Abu Dhabi. 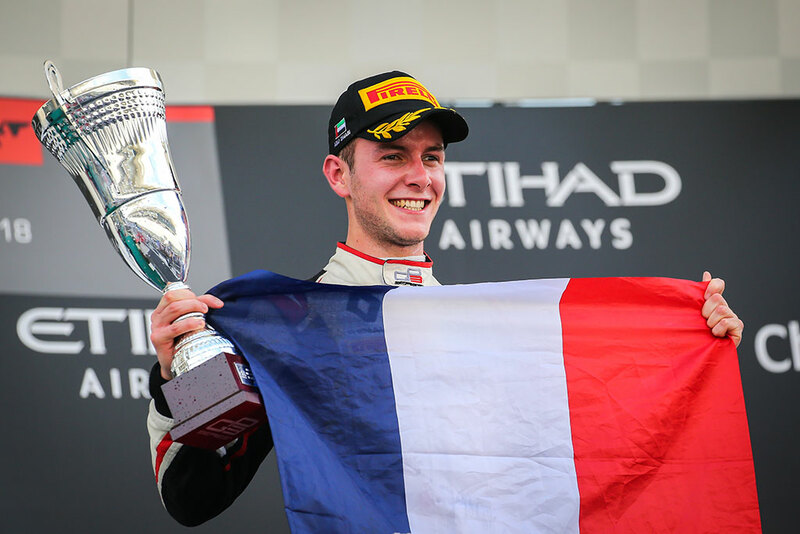 Thanks to his skills during the first race of the GP3 finale, the young French driver wrote his name in the track record of the sport discipline, of which he will remain the last champion of the history, Formula 3 taking up the torch of GP3 from 2019. Anthoine joins Charles Leclerc, Valterri Bottas, George Russel and Daniil Kvvat in the history of GP3. Anthoine and ART Grand Prix conscientiously followed their road map in Abu Dhabi, by not seeking for pure performance during the free trials on the Yas Marina track bathed by a hot sun. During the qualifications, Anthoine immediately assumed the role of leader ending his first attempt with a comfortable advance of 3 tenths over the concurrence. « We preserved our new tyres during the free trials because the new gums are a real asset in Yas Marina. I knew we were well placed at the end of the free trials. During the qualifications, I was trustful and optimistic after an excellent first run, so I didn’t change anything on the car. Unfortunately, my second attempt has not been as good as the first one, but the crucial points were ensured : a place on the top of the grid with the perspective of winning places at the beginning and during the race with the aspiration ». Anthoine made an ideal start, a good mix of speed and prudence, in order to not let his championship rival Nikita Mazepin disappear, while he tried to avoid the irreparable. Pulcini, Mazepin and Anthoine finished the first third of the race very close together. Wheels in wheels until Mazepin cracked under the pressure of Anthoine… the Russian man short-circuited a turn to remain ahead of the French driver. He got a 10-second penalty. Anthoine had to avoid committing a faux pas. Third at the finish line, Anthoine won his 11th podium and the title of GP3 champion in 2018. « My first thought was to make a good start and not to be in a delicate situation. I made a good start and I watched Pulcini and Mazepin fighting because it was not in my interest to take part in the fight. I widened the gap with Ilott and I kept my DRS to use it wisely. Then, I heard Mazepin had a penalty, so I could ensure the title keeping my place. I always want to win, but I’m not an idiot ! I preserved my tyres, the title was for me ! ». « I had nowhere to go and no option to flee from this trap which was closing on me, slowly but surely. It was not the way I wanted to celebrate my title ! But I have no regrets and I will remember the good moments of this season, and they are many : Silverstone, Le Castellet… I only missed the podium in Austria. I thank all my partners and all the people who have helped me since the beginning of my adventure in motor sport. ». Anthoine isn’t resting, but he’s working hard to prepare for the new season. He doesn’t know his competition programme in 2019 yet, but he will participate in the three trial days on the track of Yas Marina, in Formula 2, from November 29 to December 1st, with the team MP Motorsport. « Anthoine is a member of our Renault branch, so this title is a good success for him as for us. When we invest a lot, when a lot a people help and support a project, it’s good to see the results of this effort into becoming a reality. Anthoine made a championship with a lot of skills and control, as his first race in Abu Dhabi. He is hard-headed, he thinks a lot, he is stable and he carries hope. Of course, we will help Anthoine to succeed in Formula 2 next year. ». directement sur votre boite e-mail. Votre adresse de messagerie sera uniquement utilisée pour vous envoyer notre lettre d'information. Vous pouvez à tout moment utiliser le lien de désabonnement intégré dans les mails de la newsletter.